(Bloomberg) -- A strategist that called the biggest stock rally to start a year since 1987 is now saying it’s about to peter out. When CTAs hit their buy trigger last week, the quant funds started buying equities first and then hedge funds and mutual funds were forced to play catch up, McElligott’s theory goes. Now the trend-following strategies are about 87 percent short and no further covering should be triggered until the S&P 500 closes above 2,728 -- an increase of more than 2 percent from current levels. 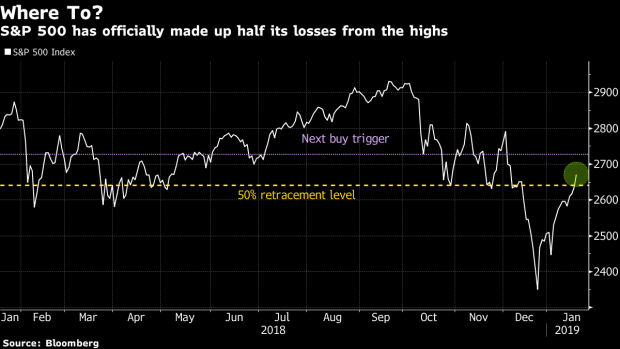 The S&P 500 fell 0.9 percent as of 10:54 a.m. New York time, after gaining nearly 7 percent to begin the year through Friday. A number of macro factors that helped spark the rally have already been priced in, signaling little room for upside in the near term, according to McElligott. The Federal Reserve can’t become more dovish unless U.S. economic data worsens significantly and positive leaks surrounding the U.S.-China trade negotiations “reached their zenith” last week, he said. Still, the bulls have corporate buybacks to look forward to in February, McElligott wrote. “Notably ‘contra’ to this ‘bearish tilt’ is that both our analog sequencing and the corporate earnings calendar begin to again pivot higher at the start of February, as the resumption of the corporate buyback bid commences largely after Feb. 6th with 75 percent of SPX out of the ‘blackout’ period,” he wrote.